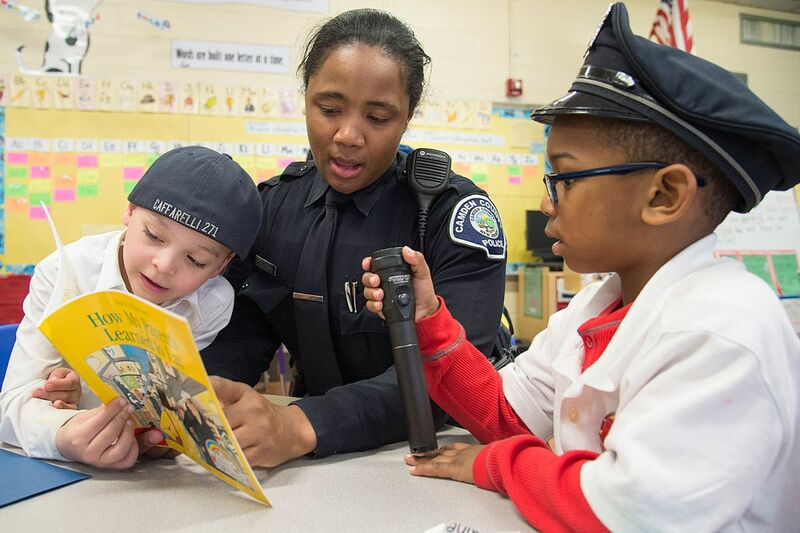 Camden County Police Officer CaBria Davis, 31, reads a book to kindergartners Jayden Martinez (left) and Quinton Gideon at Sumner Elementary School in Camden. Patrolling the streets of her hometown has benefits for CaBria Davis. Sometimes the 31-year-old police officer runs into childhood friends who are living or working in Camden. She is often struck by the changes that have come to the city's neighborhoods. Occasionally, in moments that always catch her off guard, she crosses paths with someone who knew her father. "I never knew him - only from pictures," said Davis, who was 9 when her father was murdered. "So it's nice, sometimes, to hear someone tell me they remember him." Davis, who grew up in South Camden with her mother and younger brother, became a member of the Camden County Metro police force a little more than two years ago. Her mother no longer lives in the city, and with no departmental residency requirement in place, Davis doesn't have to live in Camden. But she moved back to town before she graduated from the police academy. "This is where I wanted to be," she said. "I wanted to start where I came from. I wanted to be in a position to be a role model for the kids growing up here. I tell them, I grew up here. I went to school here. I want them to see me and think: if she can do this, I can." Since she was sworn in as an officer in January 2014, Davis has treasured the good moments afforded by the department's focus on neighborhood outreach: hosting block parties, playing football with kids, giving out prizes for limbo contests, and reading books with kindergartners. She even met President Obama when he came to Camden last May to laud the department's community policing efforts. She's also responded to homicide scenes, faced potentially violent situations, and arrested parents accused of domestic abuse, sometimes handcuffing them as their children sob. "It's hard because all they see is, you're taking Mommy or Daddy away," she said. "It reintroduces you to the reality of what's out there. You don't want to think about it sometimes, but it's necessary." Davis' parents were teenagers when she was born, and they split soon afterward. Her father, never part of her life, was 26 when he was shot in Morgan Village, a killing police believe stemmed from an argument. A man was later arrested in the case and sent to prison. Davis' mother, Sunday, was devoted to her children, Davis said. She cooked, took them to school, and chaperoned field trips. "She didn't have a positive relationship with her mom, so she wanted to give us what she didn't have," Davis said. "She tells me that she doesn't think she did enough, but I always knew I was loved." As a child, Davis never considered a career in law enforcement because she rarely encountered police. "We only saw them when something bad happened," she said. "It's not that we were afraid of them, we just never had the chance to interact." Davis attended Camden County Vocational School in Pennsauken, where she studied culinary arts, while her brother Rico went to the Creative Arts Morgan Village Academy. Davis' mother was on welfare for six years, Davis said, but she eventually went back to school, got her GED, and earned a bachelor's degree from Rowan University. Davis' mother got a job, and shortly before Davis graduated from high school, the family moved to Collingswood. Davis' mother has now worked for Camden County for more than 20 years. She teaches job readiness skills, such as resume coaching. Davis' 29-year-old brother lives in New York, where he works as a dancer and singer. In college, Davis realized she wanted to pursue a career with which she could help people. She worked two jobs to get through school, decided on criminal justice, and earned a bachelor's from Rowan University. Davis was a member of the fourth class of officers sworn in to the Camden County force, which was created in 2013 following budget cuts from Gov. Christie that forced the firing of almost half the city department, then a period of devastating crime that swept the city. The force, which patrols only Camden, was formed by county and city leaders who said they could put more officers on the streets by disbanding the city department and abolishing its union contracts. Davis started off walking a foot beat with a partner, but now works mostly on her own. The most dramatic moment of her career came in November when she and her partner, Officer Brian Cogan, saw a man brandishing a knife at people in a store on South Broadway and MLK Boulevard. When he walked out, he ignored their commands to drop the weapon and began walking south along Broadway, swinging the knife in wide arcs as he went. As more officers followed, ordering him to put down the knife, they surrounded him so that he could not approach anyone else. Officers tased him, but it had no effect. Eventually the man dropped the knife and Davis and another officer took him into custody. Davis now spends many days driving a cruiser through the city's neighborhoods, where she has gotten to know many of the drug addicts and homeless people who wander the streets at all hours. On one afternoon last week in Lanning Square, she nodded and greeted several people by name as they passed. Recently, Davis said, a young man ran up to her on the street whom she didn't recognize. He remembered her: It turned out she had come upon him overdosing in his car about a year before, and called an ambulance. Now the man wanted to tell her that he was in school. He showed her his college ID and said he had started going to church, too. "Whenever he sees me, he smiles and waves," Davis said.